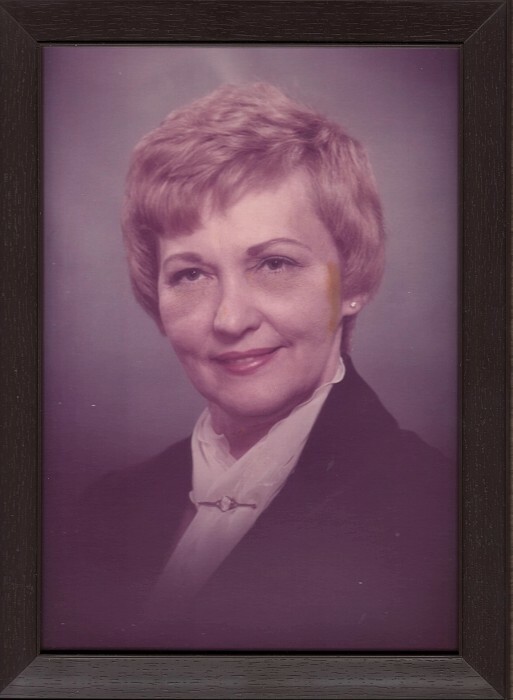 Georgia was born on a farm in Fayette County, Iowa, the first daughter of Robert and Gladys (Doan) Grimes. Georgia rode a pony to attend a one-room county school, and when she was in third grade, the family moved to Elgin, Iowa. While in Elgin High School, she played the coronet in the band and was a member of the debate team. Georgia graduated from Elgin High School in 1938. Georgia graduated from Upper Iowa University, Fayette, Iowa, with a two-year normal degree in 1941. At UIU, Georgia was invited and joined Gamma Delta Honorary society, which is restricted to 12 girls, and was a member of Future Teachers of UIU Club. That fall, she taught school in Frederika, Iowa. During George's second year of teaching, she married Warren Mitchell on December 29, 1942. Warren had received a commission as an ensign in the U.S. Coast Guard a few days earlier. Upon finishing the teaching years, she joined Warren in Astoria, Oregon. While in Astoria, Georgia worked as a clerk in a gift shop. After a year in Astoria, the family moved to Dallas, Texas, where Warren was assigned to Navy flight training. While in Dallas, Georgia worked at Neiman Marcus department store as a clerk. Later in the year 1944, the family moved to Pensacola, Florida, where Warren completed flight training. From Pensacola, the family moved to Elizabeth City, North Carolina. Warren was assigned to temporary duty at NAS St. Simons Island, Georgia. While Georgia was visiting Warren, their first son, David, was born in Brunswick, Georgia, on May 31, 1945. In late 1945, Warren entered inactive duty and the family moved back to Iowa. Warren and Georgia signed a contract to teach school in Crystal Lake, Iowa. In the middle of the 1946-47 school year, Warren was recalled to active duty in the Coast Guard and was assigned duty in San Diego, California, where Georgia joined him at the end of the school year. While in San Diego, their second son, Charles, was born on December 20, 1948. After three years in San Diego, the family moved to Argentia, Newfoundland, where Georgia taught school in the Base Military Grade School. After two years in Newfoundland, the family moved to Traverse City, Michigan, and two years later moved to the Washington, D.C., area. Georgia taught school in the Fairfax County School while living in the area. After three years in the D.C. area, the family moved to Oahu, Hawaii, for three years. Next came two years in New Orleans, Louisiana, where Georgia obtained a real estate license and managed a small real estate office. From New Orleans, the family moved to Port Angeles for two years. After Port Angeles, the family spent three years in the Boston area and three years in the New York City area. While in the New York area, Georgia attended the New York School of Interior Design, earning her degree in interior decorating. Next, the family moved to Juneau, Alaska, where Georgia worked in a dress shop. During this time, Warren retired from the U.S. Coast Guard. The next few years were spent in Fayette, Iowa, where Georgia cared for her father, then moved to Jackson, Mississippi. Georgia enjoyed military family life, making houses into homes for her family, meeting and entertaining many people, which also offered her many opportunities for fun and excitement such as a Constitution Ball in Boston; aboard a Coast Guard cutter during an America Cup race; lunch in the U.S. Senate dining hall; a champagne party late at night in the crown of the Statue of Liberty with a climb up the arm, which is not allowed for visitors; a call-out by the Crew Rex during Mardi Gras; a trip on a Coast Guard cutter to observe work on a generating plant being constructed under a lake near Juneau, Alaska; and many other interesting and exciting events. In 1978, the family moved back to Port Angeles, where they had purchased a home in Four Seasons Ranch. In Port Angeles, Georgia acted as president of the Newcomers Club, worked in a YMCA Circle, held offices in PEO, joined the United Methodist Church Circle, was active in a Square Dance Club, was very active in various bridge clubs, ushered at church many years and kept herself very busy with her Soup Parties and other traditions. Georgia really enjoyed visiting relatives and was an excellent entertainer. She particularly enjoyed periods when grandchildren visited for extended periods of time. Preceding her in death were her parents, grandson Larry Mitchell and daughter-in-law Linda Mitchell. Surviving are her husband, Warren Mitchell of Port Angeles; sister Alma Ruth Aanes of Fayette; two sons, David Mitchell of Kent, Washington, and Charlie Mitchell of Juneau and his wife, Barbara Mitchell; grandchildren Brian Mitchell of Puyallup, Washington, Amie Mitchell of Renton, Washington, Bre (Jake) Ohlson of Gustavus, Alaska, Stephanie (Rob) Day of Juneau and Sandra (Dave) Mulkey of Juneau; as well as 16 great-grandchildren and nine great-great-grandchildren. Viewing and a graveside service will be held Tuesday, October 31, from 11 a.m. to noon at Harper-Ridgeview Funeral Chapel, 105 West Fourth Street, Port Angeles, with a celebration of life at First United Methodist Church, 110 East Seventh Street, Port Angeles, on Saturday, November 11, at 1 p.m.